(CNN) -- Lessons learned from previous successful airliner ditchings helped pilot C.B. "Sully" Sullenberger save 155 lives when he put his US Airways A320 jetliner down in the Hudson River, a fellow pilot told CNN. An Ethiopian Airlines Boeing 767 is seen just before it crashes into the sea off the Comoro Islands in 1996. Twenty-three people died when an Overseas National Airways DC-9 ditched off the Caribbean island of St. Croix in 1970, and 123 were killed in the crash of an Ethiopian Airlines Boeing 767 off the Comoro Islands near Africa in 1996. But Emilio Corsetti, an Airbus 320 pilot and aviation author, said those ditchings were actually successful "because people were able to get out" -- 40 in the 1970 crash and 52 in the 1996 incident. In fact, Corsetti said, the 1970 crash helped lead to a redesign of seat belts. The belts aboard the DC-9 were "metal-to-fabric," Corsetti said, depending upon tension to keep passengers strapped in their seats. "Those things gave out... People were thrown out of their seats 10 rows up," said Corsetti, who has written a book, "35 Miles from Shore," about the 1970 crash. On the Hudson River on Thursday, the impact was like "being inside a car that crashes," passenger Alberto Panero said. Corsetti also said that the DC-9 didn't have life raft capacity for all those aboard. Unlike the A320's escape slides, which helped dozens of passengers get out, the DC-9s rafts could hold only three or four. 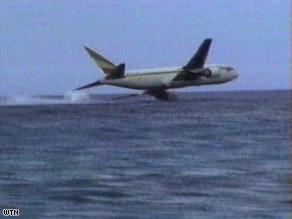 In the 1996 crash, the Ethiopian Airlines 767 was attempting a water landing off the Grand Comoro Island during a hijacking. The plane had run out of fuel. While it is uncertain whether there was a struggle in the cockpit, video shows the 767 nearing the ocean's surface. As it does, the plane's left engine hits a reef, Corsetti said, sending it into a cartwheel. He said the majority of the 123 who died drowned. They had put on life vests and inflated them before they could get out of the splintered fuselage, he said, and were trapped against the bulkheads as water filled the wreckage. The A320 also is equipped with a ditching button, Corsetti said, which closes all valves below the waterline, enabling it to float more easily. No matter the lessons learned from the earlier crashes, US Airways passengers were happy Sullenberger was in the cockpit Thursday. "He's the man! He's absolutely the man!" passenger Vince Spera said. "If you want to talk to a hero, get a hold of him because that is the hero in this whole deal."